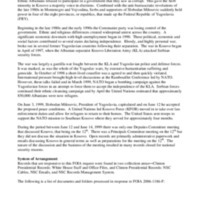 This collection consists of records relating to any National Security Council Deputies Committee or Principals Committee meetings on Kosovo held on June 12, June 13, or June 14, 1999. There was only one Deputies Committee meeting that discussed Kosovo on the 12th of June, 1999. There was a Principals Committee meeting on the 12th but they did not discuss the situation in Kosovo. Open records are primarily administrative paperwork and email discussing Kosovo in general terms. The nature of the discussion and the business of the meeting resulted in many records closed for national security reasons.